Computers, Wi-Fi, Print/Copy/FAX, Notary Public, Bookstore, Meeting room, Games & puzzles, 276 digital periodicals, Magazines & newspapers, E-books & audiobooks, plus an ever‑expanding selection of in‑library videos and books! Select from more than 1.3 million items. Place a hold on your choices. This website was created and has been maintained by the SaveCML Squad in support of Clark Memorial Library and its Friends Group, but has remained independent of both. Friends of CML now has their own website, www.friendsofcml.org, which has been designed and will be managed by Nick of Time Productions under the auspices of the FCML board. Most of the content on this site has been copied to the new site, and news and information regarding CML and FCML will henceforth be published there. Jeff King, our notoriously helpful Library Coordinator, has re-retired, and two very capable ladies are now managing the library. Come in and say hello to Eleanor Mooney on Mondays, Tuesdays, or Wednesdays, and to Mary Griffith on Thursdays or Fridays. Clark Memorial Library’s successful reopening is always cause for celebration. So it’s time to thank the volunteers who continued to expand awareness of the benefits offered by our unique community asset—particularly through promotion of the 2017/18 Art in the Clark project. 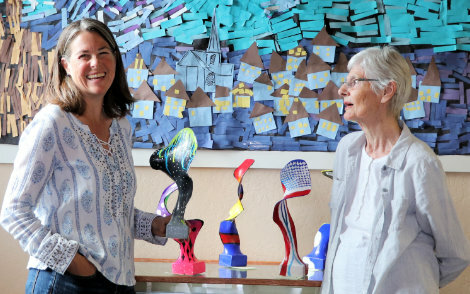 Mary Liggit (r.) with Clarkdale-Jerome Art Teacher Erika Bergamini at the 2018 C-J students’ exhibit. Carol Cain, CML patron and long-time Clarkdale volunteer, took posters for each exhibit to the many civic and church organizations in which she’s involved, as well as keeping C-JSD, C-OCSD, and MUHS informed. Kathy Ivey, CML patron, took on the 89-A corridor, visiting every business and retirement community from Phoenix Cement to Yavapai College with materials and boundless enthusiasm for what’s happening at the Clark. Patrons Zana Dirksen, Therese Hearn, Cynthia Mala, Henry Melody, David Perrell, John Sherman, and Ruth Wicks each distributed materials to locations convenient to them, lightly but personally covering the Verde Valley. Art exhibits in the library have drawn much appreciation. Visit the Art in the Clark page for the season schedule and sample images, then come to ‘The Clark’ and admire the craft and creativity in person. 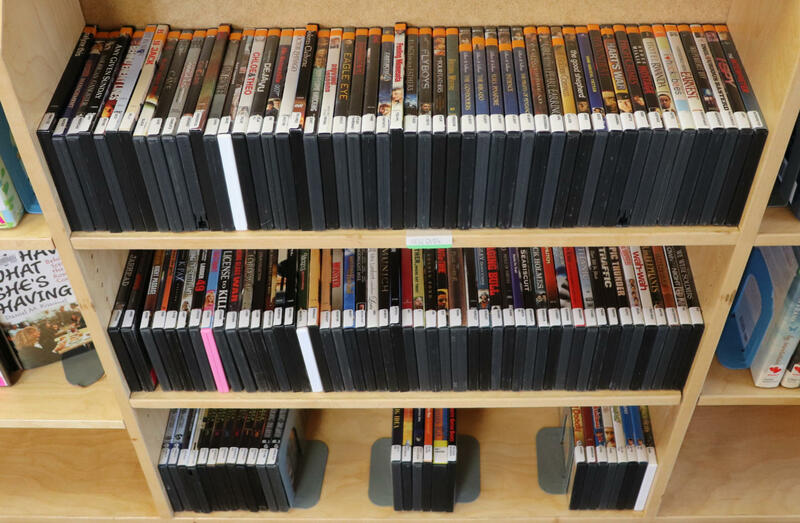 Clark Memorial Library’s financial support from its Friends group is apparent in the abundant new videos and books on the “new items” shelves in front of the check-out counter. More of both arrive regularly. Come on in and check them out! 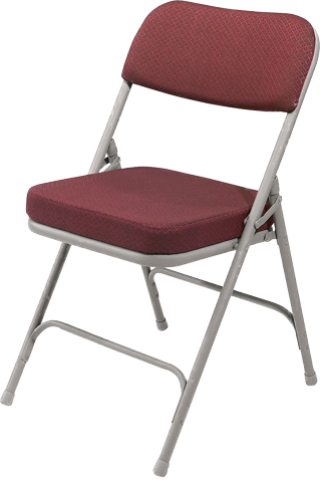 Friends have also provided 6 new padded chairs in the meeting room, for a total of 10. Groups seeking a pleasant place to hold meetings will find it here. Clark Memorial Library is offering more services to the community, but suggestions for improvement and offers of assistance are always welcome. Talk to the Library Coordinator. From left to right, Clarkdale Mayor Doug von Gausig, Vice Mayor Richard Dehnart, YCFLD Director Corey Christians, YC Supervisor Randy Garrison, and FCML President Jimmy Salmon combine their strength to close the scissors that cut the ribbon to officially reopen Clark Memorial Library, while an ecstatic throng of library lovers record the event. Much has been accomplished since the ribbon was cut at Clark Memorial Library’s 90th Birthday Grand Re-opening Celebration. Transition from a historic Clarkdale Town Library to a historic Yavapai County Free Library District Branch Library went without a hitch (three cheers for Third District Supervisor Randy Garrison, YCFLD Director Corey Christians, Assistant Library Director & County Librarian Susan Lapis, the District’s staff, Clarkdale Town Manager Gayle Mabery, and all the Town staff who aided in the seamless transfer!). 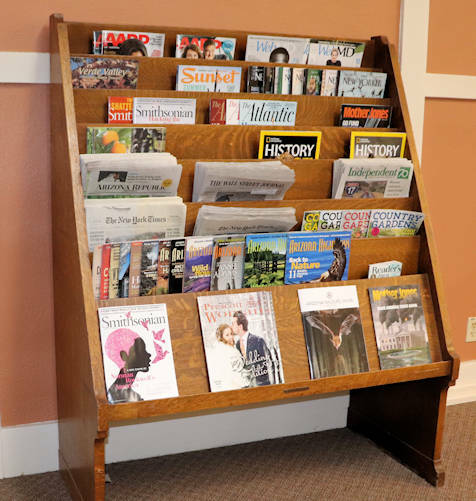 CML’s antique, solid oak magazine rack was located and restored to the library. You’ll now find it filled with current issues of The New York Times, The Wall Street Journal, The Arizona Republic, and The Verde Independent, as well as National Geographic’s History magazine, The Atlantic, AARP, Smithsonian, Mother Jones, and WebMD, plus various issues of magazines donors thought might be of interest, such as Arizona Highways, Country Gardens, The New Yorker, and Sunset Magazine. Equipped with Full HD monitors and MS Office productivity software. 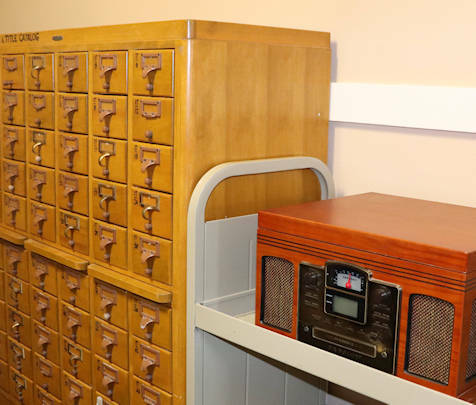 The Clarkdale Historical Society returned this beautiful antique card catalog to CML, where it belongs. It now needs a volunteer horticulturist to stock it with seeds patrons can check out, plant, harvest, and share. Could you be the one? Talk to the Library Coordinator. Patrons can now have documents notarized without charge. A growing selection, with the most recent arrivals on the shelves in front of the check-out counter. Tell the Library Coordinator if there is something missing you would like to see. Intended for students in grades 3–5, the 2018 Summer Reading pilot program featured geology, paleontology and archaeology reading assignments augmented with demonstrations and activities. Future programs will be designed to make continuing education fun for patrons of all ages. Programs and events for school kids and adults are in the planning stage, along with support for local book and video clubs. Check back here regularly to see what’s happening at Clark Memorial Library! This website is a volunteer effort to encourage patronage and community support for Clark Memorial Library. It is not affiliated with the Yavapai County Free Library District, whose official website for Clark Memorial Library is at http://ycfld.org/clarkdale. 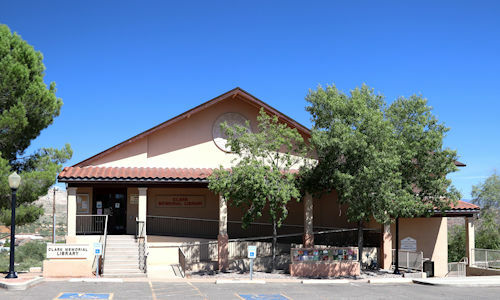 Friends of Clark Memorial Library is an all-volunteer 501(c)(3) Arizona non-profit corporation dedicated to the financial support of Clark Memorial Library. Current content on http://clarkmemoriallibrary.org is moving to a new website maintained by Friends of Clark Memorial Library. The new web address is http://friendsofcml.org and you will be redirected there in 30 seconds. The 200,000 oldest books collection housed in the impressive Long Room at Trinity College Library in Dublin, Ireland, includes manuscripts dating back to the 9th-century Book of Kells, but you won't be able to check them out. Better to “move along, move along” to Clark Memorial Library at 39 N 9th St in Clarkdale, Arizona, where over 700,000 unique items are available through the Yavapai Library Network. ‘The Clark’ is a cozy little public library with plenty of current and classic videos, a growing collection of Southwest-oriented books, and displays by local artists…plus easy access with plenty of parking. 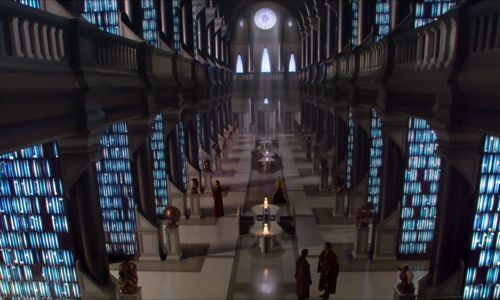 CML is not likely to appear in a Star Wars episode as the Long Room did (disguised as the Jedi Archives in Episode II), but its patrons have no problem with its unpretentiousness.